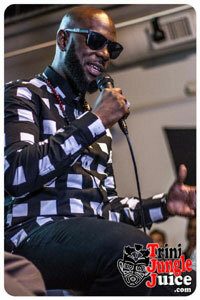 Bunji Garlin Causes 'Soca Tabanca' in Los Angeles! It rained, the 7p - 10p window was short, it was 'cold' (60F degrees) for Angelenos living in LA, but it never deterred the 200 or so by-invite-only guests -- ranging from LA entertainment industry folks, music savvy tastemakers, bloggers and of course the Caribbean elite, who came to witness Sonos Studio's first-ever showcase of Soca music. Vesseled by Trinidadian artist Bunji Garlin, guests were not only treated to a stellar performance by the aforementioned artist. But before he took stage to echo familiar songs from his 2014 release, Differentology (VP Records/RCA), featuring such songs as the title track, "Carnival Tabanca", "Red Light District" and others, host actor/comedian Gerry Bednob ("40 Year-Old Virgin") thrilled the audience for about 15 minutes for a just-as-entertaining Q&A with Bunji Garlin, who exemplified that night what it took to be one of the most eloquent ambassadors of Soca music beyond Caribbean shores. Amongst the guests, 3 "carnival babes" in full costume -- including two in headpieces, greeted the arriving guests, who wasted no time in snapping pics before Bunji showed-up after 8p, coming out from behind closed doors, in the Sonos Studio "green room". Backstage there, he took sips of Angostura 1919 Rum, greeted his label reps, as well as the Sonos' production and corporate staff. At the same time - outside the "green room" - all the invited guests patiently relished awaiting his official entry to the stage, because they themselves also had the delights of enjoying an open bar of Angostura 1919 Rum, or Modelo and Stella Artois beers. With a Spotify playlist curated by yours truly, and piped at the ultimate quality through Sonos speakers draped and surrounding the entire studio listening space, familiar soca hits from yesteryear to today including songs such as "Madame Jeffrey" by Scrunter, "Disco Daddy" by Lord Nelson, "Wotless" by Kes The Band, "Miss Behave" or "Raze" by Fay-Ann Lyons-Alvarez, "Phenomenal" by Benjai & H20 Phlo, "Ah Feeling" by Lead Pipe & Saddis and many others, created that carnival/fete atmosphere before the real jamming by Bunji started! Once he and his entourage revealed themselves from the "green room" by walking towards the stage through the crowd -- who btw started howling, whistling and screaming, those in awe of his presence moved-in closer to witness Soca excellence -- in demeanor, diction & delivery. Bunji not only rocked from on-top the stage, but it's probably the first time an artist at the Sonos Studio ever jumped down from the stage amongst the crowd, still with mic in his hand, creating a true frolic amongst the usually stiff, industry types that sometimes refuse to let their inner 'fan' out. Tonight, on the first night of Chanukah, they had no choice... besides, with the aide of some true Trinis with flags n' rags waving, it was unavoidable to NOT get down, wine, bump n' grind, or whatever you wanna call your form of boogie! It was an evening in Los Angeles where a true melting pot of many races, faces, professions and musical taste buds experienced a lil' taste of Trinidad & Tobago's beautiful carnival-ish diversity, both intellectually and visibly. 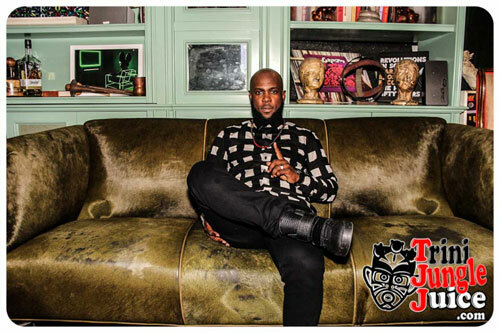 But most of all, with the help of course from Sonos Studio's primary focus for 'listening', we also soca-experienced Bunji. HuffPost writer/blogger and Trini-transplant Marlon DJ Pelau Regis also hosts his own personal blog.